Nintendo 3DS flash card R4 adapter for backup roms. 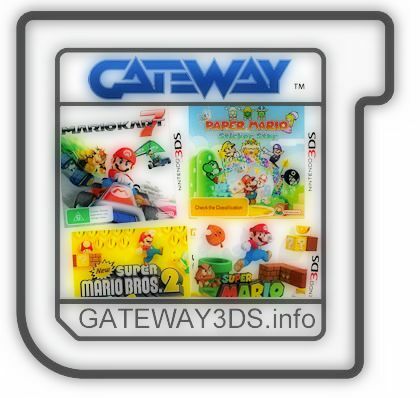 Q: Can Gateway 3DS kit run the old 2D NDS roms? A: Yes – the Gateway Blue Card runs on a customized R4 WOOD firmware and is essentially equivalent to a R4i Gold SDHC card that is capable of running NDS roms on the original DS, DS Lite, DSi, DSi XL, 3DS and 3DS XL consoles. 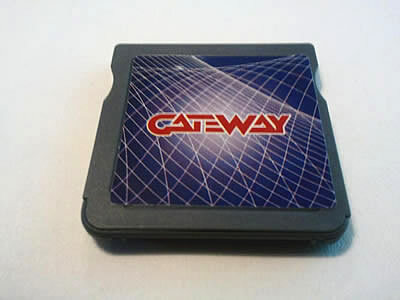 Q: Can the Gateway Blue Card run DS homebrew games and emulators? A: YES – as mentioned before the GW3DS Blue cartridge is a 3DS/ DSi / DS compatible NDS rom backup device that can run all your favorite NDS homebrew games and emulators: Lameboy Gameboy & GB Color emulator, nesterDS NES emulator, SNEmulDS SNES emulator, jEnesisDS SEGA Genesis emulator for DS just to name some. Best of all the Blue cart is already compatible with 3DS firmware up to version 6.1. Lameboy -- Gameboy/Color emulator; Save with X button or through Exit on menu; Supports savestates, Super Gameboy, Rumble Flashcarts need testing; Auto DLDI. nesterDS -- NES emulator; Auto DLDI. SNEmulDS -- Super Famicom / SNES emulator; Supports EZ-V 3-in-1 Expansion Pack & Ewin Expansion Pack! Auto DLDI. jEnesisDS -- SEGA Genesis emulator for DS and 3DS; Supports sound as of 0.6; Auto DLDI. ScummVM -- Point and click adventure game interpreter (Lucasarts, Sierra, etc. ); Auto DLDI. lolSNES -- New high level SuperNES emulator for R4 DS cards. Limited compatibility but runs games at full speed. snesDS -- Super Famicom / SNES emulator; with rather low game compatibility and some issues with larger ROMs; Auto DLDI. SpeccyDS -- ZX Spectrum emulator. StellaDS -- Atari 2600 emulator; Auto DLDI. StyxDS -- Atari ST emulator; runs at < 20% speed. AmEDS -- Amstrad CPC 6128 (8-bit computer) emulator. ColecoDS -- ColecoVision (CBS) home video game console emulator; Auto DLDI. CrocoDS -- An Amstrad CPC 464/6128 emulator; Works fine and at full speed with most games. DS85 -- TI-85 calculator emulator; Requires ti85.rom to run; Auto DLDI. DSMasterPlus -- Sega Master System emulator; Auto DLDI. PicoDriveDS -- Sega Genesis emulator. pokeyDS -- Atari 800XL computer emulator. ThomDS -- Thomson MO5 (8-bit computer) emulator. WabbitDS -- A fantastic and almost perfect TI-83+ emulator/clone; HIGHLY RECOMMENDED! TI-83+ ROM needed; Select ROM at first launch. ZXDS -- ZX Spectrum emulator. fmsxDS -- MSX, MSX2/2+ (8-bit computer) emulator; Use Japanese BIOS! Auto DLDI. FrodoDS -- Commodore 64 Emulator; Runs and CAN mount most disk images; If it can't, it's due to the C64 rom (.d64 file) itself; Try a different game and it should work; Auto DLDI. MarcaDS -- MAME's arcade 8-bit game emulator; Games play in 1.17; Prev. 1.16 said Menu works but both screens go black when executing games. NeoDS -- Neo Geo AES/MVS emulator. nesDS -- NES emulator; Touch screen menu issues on some flashcarts; Auto DLDI. PenkoDS -- MSX2 emulator without SCC emulation. Torrent links for all the NDS and 3DS rom files. Regional distributors and sales representatives needed. How it feels to be the first one to hack the latest gen console to a point where it can run backups?